As Congress gets ready to return from its August recess and address the pressing issue of whether to take action in Syria, it does so amid largely unfavorable views from the public. Seven-in-ten Americans have a “very” or “mostly” unfavorable opinion of Congress, according to the Pew Research Center’s most recent survey in July. That matches the highest unfavorability rating in the nearly three decades we’ve been asking that question. But while many observers have judged Congress’ productivity simply by how many laws it’s passed, we chose a stricter standard: How many substantive (i.e., nonceremonial) measures have become law? 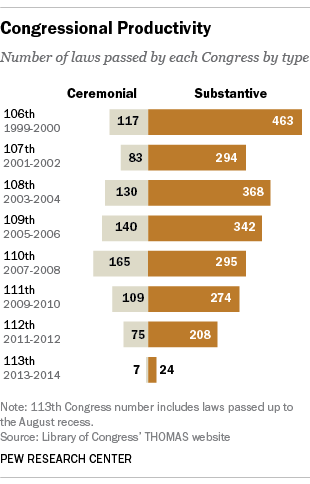 To find out, we looked at every public law passed since the 106th Congress in 1999-2000, excluding post-office renamings, commemorative-coin authorizations, Congressional Gold Medal conferrals, and the like. The results: So far, this year appears to be on track to be one of the least productive. Of the 31 measures that have became law so far this Congress, 24 count as substantive by our admittedly generous definition. That’s five more than the 112th Congress managed to get through by Labor Day 2011, and three more than the 107th Congress mustered at the equivalent point in its term. However, the 113th is well off the pace set as recently as 2007, when 45 substantive bills had become law by the end of August; even in 2009, when Congress was riven by disputes over health-care reform, financial regulation and economic stimulus, 38 substantive laws had been enacted by summer’s end. More broadly, since the 106th Congress (1999-2000) there’s been a steady downward trend in the volume of legislation, both total and substantive only. That’s coincided with increasing polarization in both the House and the Senate, making it ever harder to find enough common ground to pass bills — even if they manage to come together on Syria.